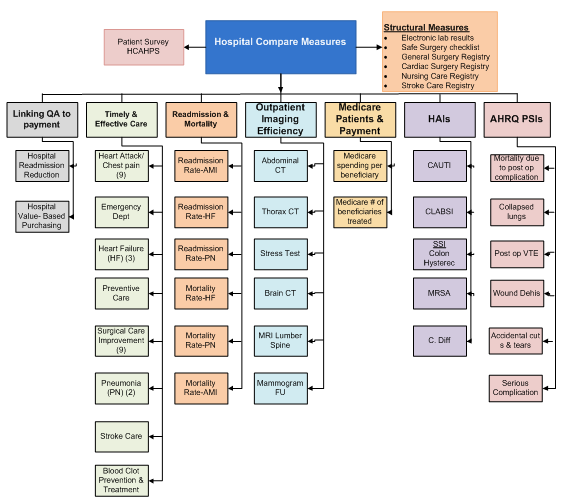 Hospital Compare was created as a result of the Hospital Quality Initiative through the efforts of the Centers for Medicare and Medicaid Services (CMS) and the Hospital Quality Alliance (HQA). The HQA was a public-private collaboration established in December 2002 and it consisted of organizations that represented consumers, payers, hospitals, clinicians, accrediting organizations, federal agencies, and other stakeholders. The HQA disbanded in December 2011, and CMS currently maintains the Hospital Compare Web site. This report provides information for consumers to make informed decisions and select hospitals through direct performance comparison related to many conditions. Hospital Compare ranks hospital based on Better, No Different or Worse than U.S. National Average. there is less than 100 HCAHPS surveys submitted to CMS.